If there is one thing I know that I’ll be at DCon 2018 (other than hungover, obvs) and that is HUNGRY! Hungry for Designer Toys and hungry for snacks! 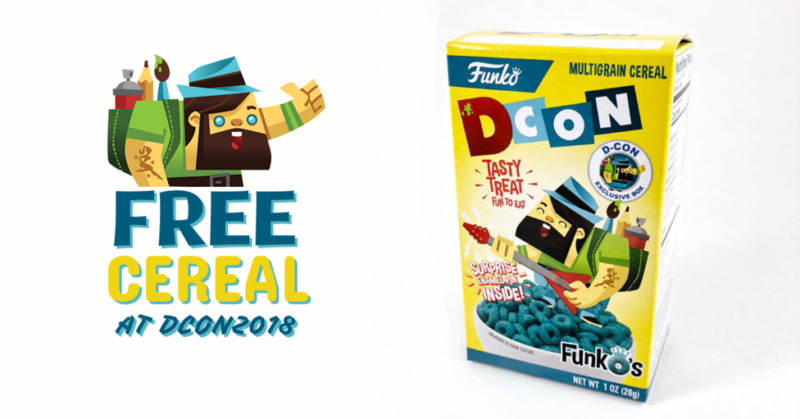 Looks like my hunger for snacks will be quenched by the announcement that DCon have teamed up with Funko to give out FREE boxes of DCon Multigrain cereal to the first 1,000 people though the DesignerCon doors EVERY DAY! Each box comes with its own surprise enamel DCon pin! Win! We already knew that Funko were heading to DesignerCon as part of the Saturday Morning booth #3600 bringing with them a range of special cereal releases. One of which is the Chevy Metal cereal which will only be available to those with After Party tickets (tickets HERE). You can read more about the Funko involvement at DCon HERE. Other than Chevy Metal Cereal, there will be other designs available all DCon weekend. If you want to stand a chance to nab your FREE box of DCon Cereal, you are best to get a VIP ticket to get early entry before the general riff raff. You’ll also get entry to the VIP Preview Night on Friday 16th November too! Another win! Buy your VIP DCon (and non-VIP) tickets HERE.